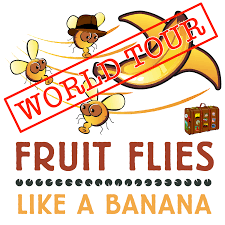 ‘World Tour’, the second offering by the ‘Fruit Flies’ team, consists of an interactive recital of musical pieces from around the world, being presented through a mixture of performance art and musical virtuosity. Hilary Abigana (flute), C. Neil Parsons (bass trombone), and Greg Jukes (percussion and accordion), are the perfect team, staying both literally and figuratively in harmony throughout. Their opening routine (on hoverboards!) just prove how seamlessly and intuitively these three musicians work together as a team. ‘World Tour’ treats the audience to a musical experience, seamlessly melding education and performance. It is equally interesting for children as for adults, and is a great show for the whole family. A creative and delightful way to introduce an audience to both classical music and folk songs, by three alarmingly talented performers.